Surf down the 17′ tall Fire Dual Lane Water Slide and cool off this Summer while you have a great time. 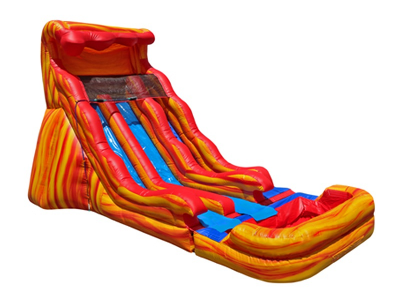 Rent the Fire Dual Lane Water Slide for your next party or event and race with your guests in this 2 lane exciting slide. Riders climb up to the top, pick from one of the 2 lanes, slide down under the water misting system and splash into the pool. Great for ages 8 and up to adults. Regular garden hose needed to the setup location, not provided by MJR. Price shown is generally for an 8 hour rental period, please select delivery and pickup times accordingly. Select a delivery time at least 1 hour before your event start time. Next morning pickup, Overnight Option, is provided with a $100.00 fee. Next morning pickups are generally done between 8am and 12pm. It is the customers responsibility to measure the setup location to make sure rented product will fit. Cancellations must be done within 72 hours before the rental date or else a cancellation fee up to the entire rental amount may apply. Exceptions are made for cancellations on Rainy or Inclement weather days, please check Rain Policy for more information. No Stairs allowed to the setup location. A regular Water/Garden Hose and continuous water supply is required (not provided by Magic Jump Rentals) to the setup location. Magic Jump Rentals will provide a water mister to hook up to customer’s water/garden hose. Need 5′ Wide Pathway to Setup Location.